I’ve taken a break from blogging these last few months, but I plan on making it more of a priority in 2014. This year has been such a waste in terms of my weight loss journey! 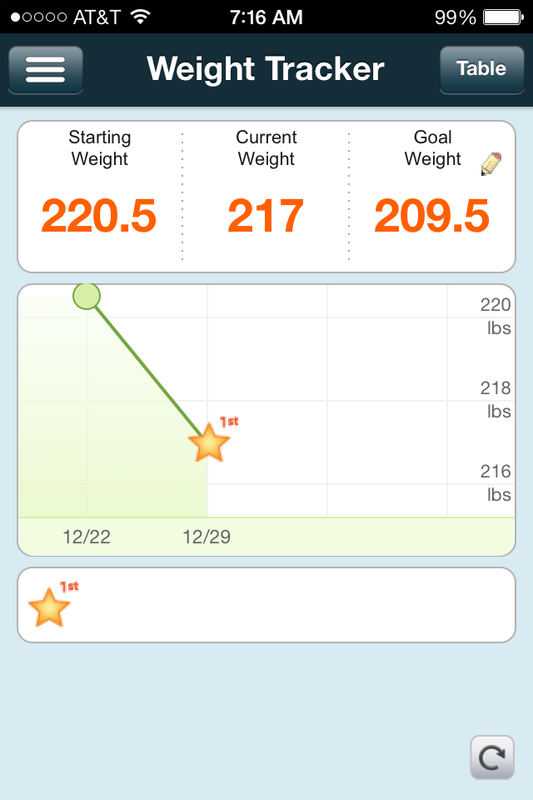 I started Weight Watchers in 2/2011 at 227.6 pounds, lost 30-ish pounds over the rest of 2011/early 2012 and then something snapped in my motivation, leading me to end up back at 220.5 this last weekend. Enough was enough, I completely undid all the efforts I accomplished and now basically have to start over. That’s okay though. I reset my Weight Watchers numbers on eTools and started with the new weight of 220.5 — now, after only a week of tracking I am down 3.5 pounds and I was able to have such a good loss over Christmas! That gave me a great boost of motivation. I am not going to make any weight loss resolutions this year, I am just going to keep going with my tools. I have lots of new things taking me into the new year, and I am excited to see my progress. The first thing I am doing is interacting with a virtual book club set up by my favorite leader in Colorado. We are reading the book ‘100 Days of Weight Loss‘ as a group – it’s a daily reflection/journal/challenge that I hope will have good information. I will also be using the daily reflection as a blog entry, so that will also help me keep on top of blogging. Next, I bought the new Plan & Track from Weight Watchers. I love the new features which include a menu, grocery list and weekly to-do list. One of my major issues with planning weekly menus is writing them down on piece of paper and losing it halfway through the week, or losing track of all the different Internet sources and cookbooks I used to create my menu. Now I can do everything I need in one spiral notebook and I am good to go! I also have plenty of gym classes to join in at L.A. Fitness so I can take some of the boredom out of going to the gym throughout the week on those days I just don’t feel like going. My goals this year are to just stick with Weight Watchers and do the best I can…another year has come and gone and I am tired of the same result!